These are the words of him who has the sharp, double-edged sword. 13 I know where you live—where Satan has his throne. Yet you remain true to my name. You did not renounce your faith in me, even in the days of Antipas, my faithful witness, who was put to death in your city—where Satan lives. 14 Nevertheless, I have a few things against you: You have people there who hold to the teaching of Balaam, who taught Balak to entice the Israelites to sin by eating food sacrificed to idols and by committing sexual immorality. 15 Likewise you also have those who hold to the teaching of the Nicolaitans. 16 Repent therefore! Otherwise, I will soon come to you and will fight against them with the sword of my mouth. 17 He who has an ear, let him hear what the Spirit says to the churches. To him who overcomes, I will give some of the hidden manna. I will also give him a white stone with a new name written on it, known only to him who receives it” (Revelation 2:12-17). Pergamum is referred to as the city where Satan has his throne. 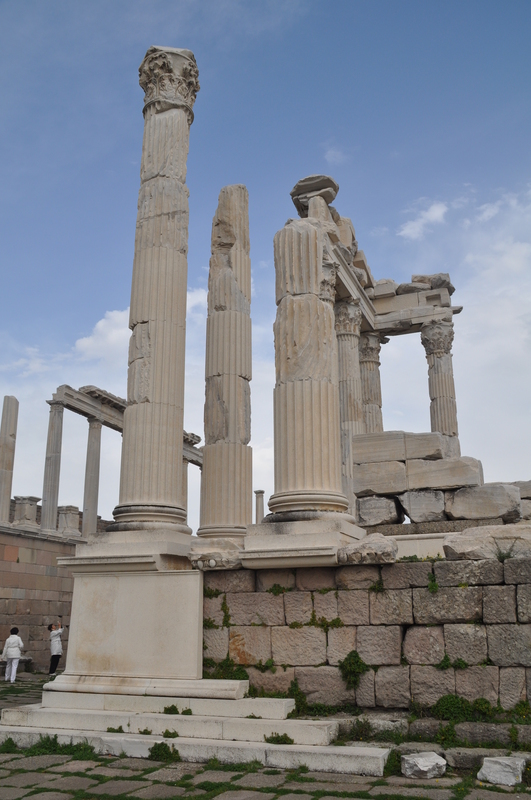 Upon arriving at Pergamum you can immediately see what John, the beloved, is referring to. Pergamum, like most ancient cities has the common people living below in the valley, and the elite and religious leaders living high in a temple fortress. In the Acropolis of Pergamum all the local leaders had their grand palaces, but even grander were the palaces of four major Roman deities. These included Dionysus/also called Bacchus (next to amphitheatre); Athena (Wisdom; whose temple is next to library); Zeus (most powerful god); Trajan (Roman Emperor from 138AD) on top of the mountain. Surrounding the mountain were other minor deities. The white marble grandiose temples would have easily been considered a wonder of the world in the days of the early church. These deities represented power and control (Emperor Trajan). Sexual immorality and other kinds of debauchery (our English word “debauchery” comes from the name of this god Bacchus also known as Dionysus). Zeus is the supreme God of the Greeks and represents the strongest and most powerful of deities. Athena represents wisdom and the power of humanism. Next to every temple of Athena is always a library. Together, this mountain of worship represents what Revelation refers to as the throne of Satan. In spite of living where the throne of Satan was, our Lord commends the believers for being faithful. He continues by saying, “You did not renounce your faith in me, even in the days of Antipas, my faithful witness, who was put to death in your city—where Satan lives” (Revelation 2:13). The believers were faithful, yet they were under severe persecution, even martyrdom. The Bible refers to Antipas. We know nothing more about Antipas from the Bible because the other 65 books of the Bible had already been written when Antipas was a church leader. However, from the early church history we do know more about Antipas. Antipas was the overseer of Pergamum during the reign of Roman Emperor Domitian in 83 AD. The name “Antipas” means “against all” which could represent that he was standing alone for the faith against the forces of evil. According to church tradition Antipas was appointed overseer of Pergamum by the Apostle John. The fate of Antipas is recorded by Simeon Metaphrastes. The residents of Pergamum were worshipping demons (and other “deities”) who had appeared to them and the demons told them that they could not live there nor accept their sacrifices because of Antipas was casting them out. Antipas was captured and delivered to their Roman governor who tried to convince Antipas that the older things are more honorable than the new. They tried to convince him to follow the traditions of men. Antipas countered the argument by using the example of Cain and Abel. Even though Cain was older than his brother Abel, Abel was accepted by God and Cain was not. Cain, by killing his brother is hated and despised by all men who have lived thereafter, even though he was older, therefore the Greeks’ impiety is hateful to the Christians who came later, even though it is older. When the governor and the Greeks heard this they burnt with anger at the elder Antipas. He also refused to offer a sacrifice to their gods in the red hot copper bull-shaped altar of Caesar, so was thrown into the same brazen altar alive and roasted to death. His last words were glorifying Jesus Christ and his great power. Antipas thanked Jesus for being worthy to suffer for His love. Antipas’ life and death were a credit to the believers in this wicked place. The Lord continued by giving an admonition to them by saying, “14 Nevertheless, I have a few things against you: You have people there who hold to the teaching of Balaam, who taught Balak to entice the Israelites to sin by eating food sacrificed to idols and by committing sexual immorality. 15 Likewise you also have those who hold to the teaching of the Nicolaitans” (Revelation 2:14-15). In his admonition of the church we see two key errors: First is compromise with the corruption of sin and evil around them, and secondly is following the tradition of men instead of what is true. What we see is that in the area of intense worship of demons and demonic princes (deities) with rampant immorality, greed and hunger for power clearly the Christians (represented by Balaam and Balak). Apparently many Christians had compromised on living a holy life, with just being a “little better” than the followers of the other demons. Compromise had crept into the church. Additionally, Pergamum represents the church of Rome dating from the time they instituted the Nicolaitan system of separation of the priests and laity and throughout their history with giving heed to seducing spirits and the doctrines of demons. Antipas represents the opposition to the excesses of Rome and the tradition of men. He was killed for standing against these forces. Elements in the church have fought against the doctrines of the Nicalaitians for centuries and continues to this day. The doctrines of man seep in slowly and sound good, have well defined religious systems, yet they are not of God. They are only the traditions of men which dilute and nullify the truth of Jesus. So, Jesus warns them saying, “16 Repent therefore! Otherwise, I will soon come to you and will fight against them with the sword of my mouth” (Revelation 2:16). The response to compromise and following the traditions of man? Simply to repent. Jesus warns, if the believers do not repent, he will come against them. If Christ is against them, they could never stand. He will defeat them, not with military might, through a sword is mentioned, however, he will defeat them with the truth. The sword represents absolute truth found in Jesus alone. Jesus concludes by saying, “17 He who has an ear, let him hear what the Spirit says to the churches. To him who overcomes, I will give some of the hidden manna. I will also give him a white stone with a new name written on it, known only to him who receives it” (Revelation 2:17). In the Roman centuries, people would give white stones with a name as an award, kind of like a trophy. So, by saying this Jesus is saying they will receive a crown and honor from Jesus. Even though they are persecuted and killed, those who remain faithful and overcome will receive an honor from God. God honors faithfulness and overcoming. In this same passage of promise, he speaks of manna. Manna represents the daily dependence on Christ. Manna represents everything a religious system is not. It is not planned, it is not systematized, it is not understandable, but it is instead utter dependence on Jesus Christ. Only this dependence will receive a white stone (pure crown of Christ). 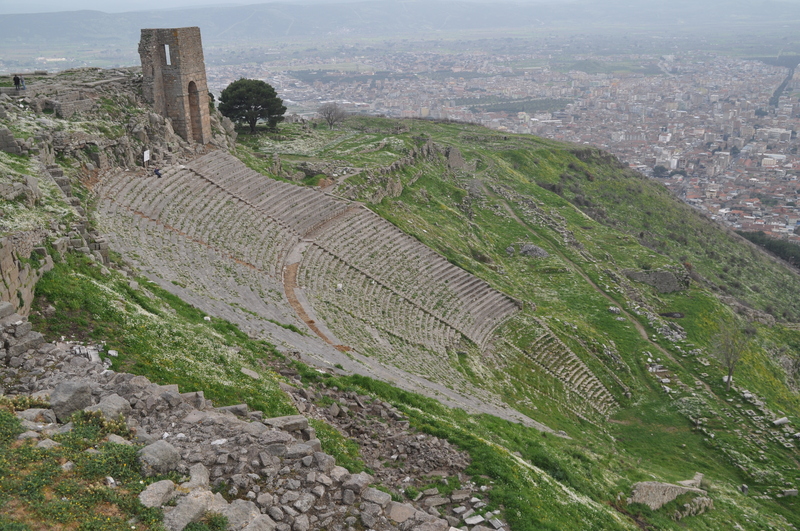 Today in Pergamum, of a population of 80,000 people there are no Christians. Not one. The throne of Satan is destroyed and will never be a glorious place again. The stones of its temples are in museums across the world and what is left on the mountain is only broken rubble. However, after centuries of Christian influence, the church became corrupt and it was destroyed. As I know God. He will not allow this shame to last forever. At the throne of Satan, one day, will raise again a pure church which overcomes evil for righteousness.